It was great to visit Ritz-Carlton in San Francisco for the Modern Luxury Weddings Show.We went in and set up our Invitations booth as usual and then were treated to a Ritz-Carlton Breakfast with the family in their dining room. We then, Jacques, Eva, Jacko and I went back to our Invitation Wedding Show post. 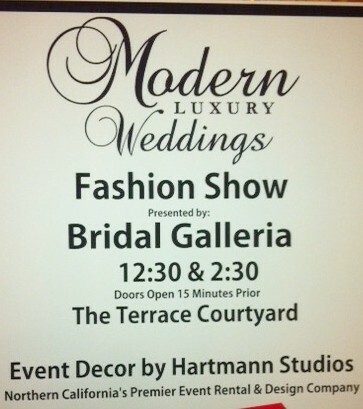 By then there were people lined up waiting for the Modern Luxury Bridal Show. 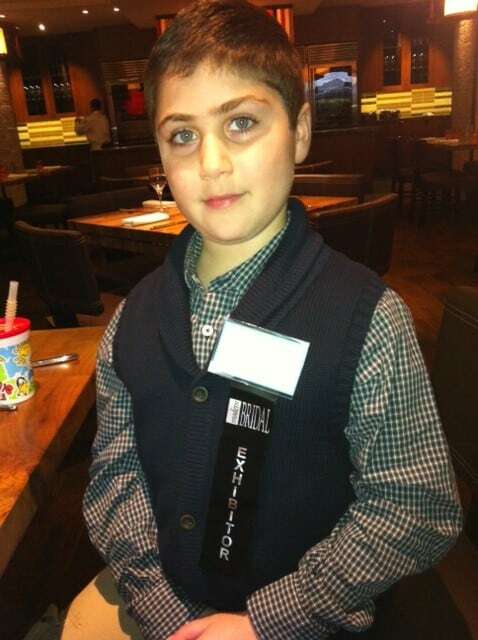 Money, our assistant, had also arrived and our table looked pretty cute. Our table displayed custom invitations we had designed for clients and calligraphy samples, lined envelopes and assorted place cards with calligraphy were also peppered around the table. Soon the brides and grooms were streaming through the doors and Champagne was flowing from Morenobhlv, chocolates adorned the tables and there was cake samples being passed out! 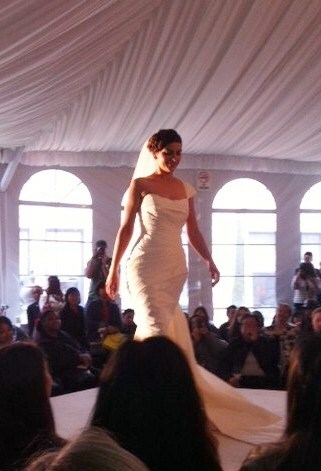 Soon, Eva and I took our seats at the Bridal Galleria Fashion Show, which took place right outside the venue in a tent. There was a water fountain right outside the window, an over-sized crystal chandelier, music and chairs were lined up around the runway just like high fashion runway show in New York. Bridal Galleria announced their models who were modeling the latest designs from Lazaro, Jim Heljm and Monique Lhuillier. After the fashion show we tasted champagne, little peanut and chocolate treats and also stopped by the Nordstrom Bridal Gown area. Overall the show was a hit because there were a lot of smiles and happy couples. It was great to see fellow colleagues and friends like Ran Jan Dey from New Delhi Restaurant and Sacko from Giraux Jewelers. Thank You Wedding Woof for writing about us! Congratulations to all newly engaged couples. 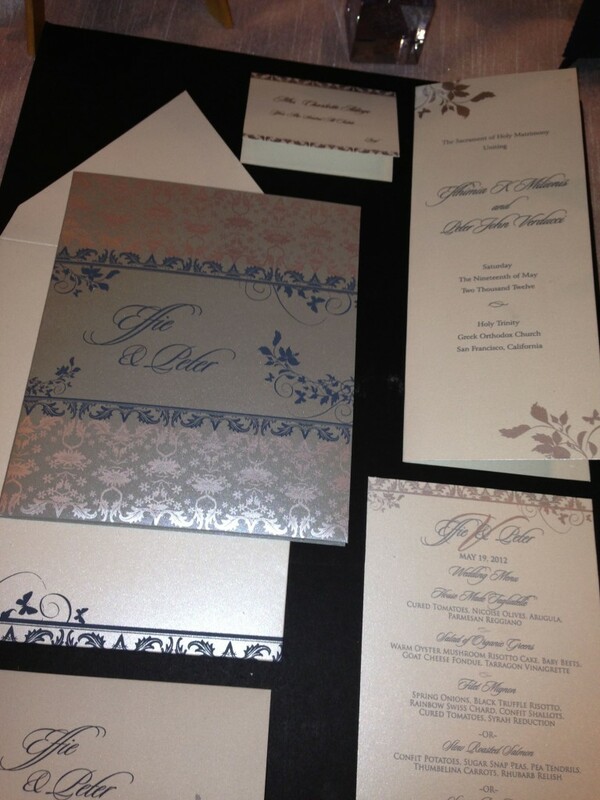 Please call, email or stop by our store at 3 Embarcadero Center, San Francisco California if you’d like to work on custom wedding stationery and calligraphy for place cards, menus and envelopes! 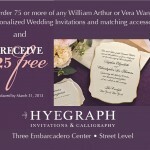 Thank You for considering Hyegraph Invitations for your Wedding Invitations, Save the Dates and Calligraphy!